Want to have a kitchen session with your kids with an easy, not messy, and ultimately delicious recipe? 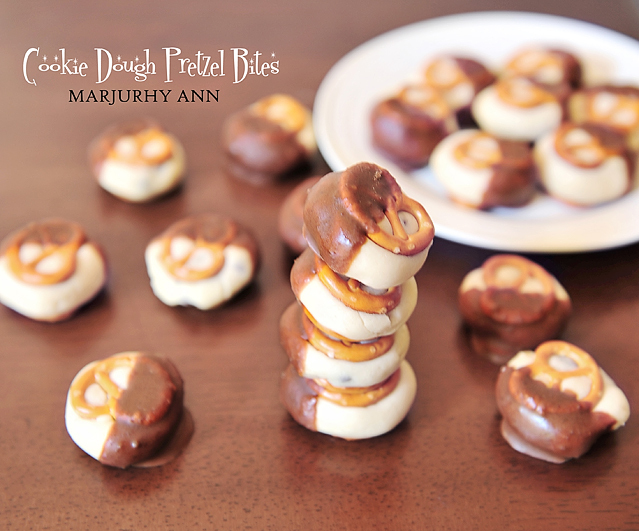 Try this NO BAKE Cookie Dough Pretzel Bites. You read it right. No baking needed. In a bowl, using a mixer, beat the butter, brown and white sugar until creamy. Add milk and vanilla. Add the flour and salt to the mixture. Mix from low speed to medium until it comes together and perfectly combined. The dough will be thick. Then mix the chocolate chips using a spatula. Roll the dough into balls about 1 2/3 tsp of dough per sandwich (depends on how thick you like it). Sandwich it between pretzels and place on the baking sheet. Freeze for 20minutes. While your pretzel bites are chilling, melt the chocolate with continuous stirring. You may add shortening or a little milk. Let it cool and dip the pretzel bites halfway. Put it back to the baking sheet and refrigerate again for at least 10mins. Keep refrigerated. Posted in EpicureTagged baking sheet, chocolate chips, cook, Cookie Dough, cooking session, eat, epicure, foodie, foodporn, Marjhury, No bake, Philippines, Pretzel, Synopsis of a NomadBookmark the permalink.